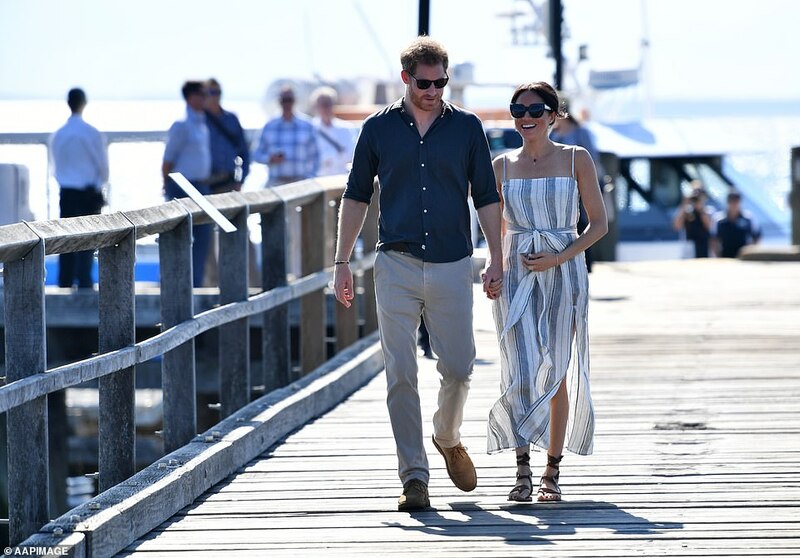 Prince Harry and Meghan held hands as they walked along a jetty on picturesque Fraser Island after the couple were reunited after spending the day apart. 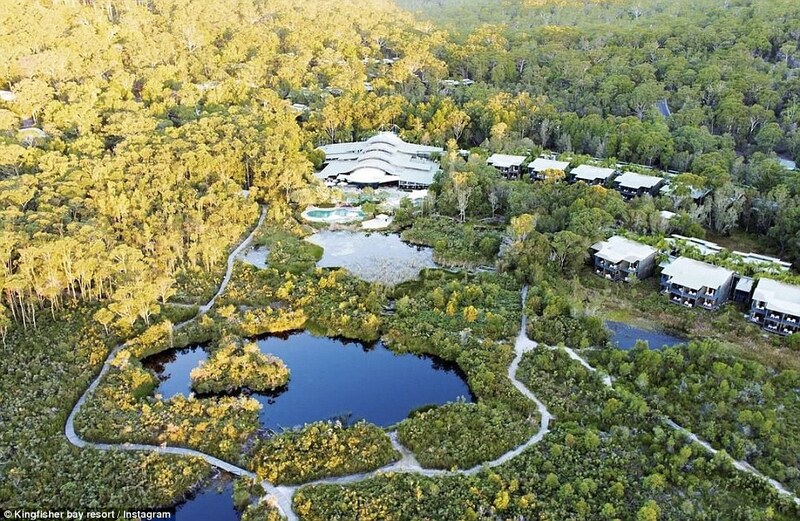 The pregnant Duchess of Sussex had skipped today’s royal engagements to take a well-earned break at the exclusive Kingfisher Bay resort. Looking summery in a Reformation maxi dress and brown leather lace-up sandals, pregnant Meghan was glowing as she arrived by car to meet Prince Harry, having spent the morning at their hotel recuperating from the heavy schedule of the first week of their Commonwealth tour. 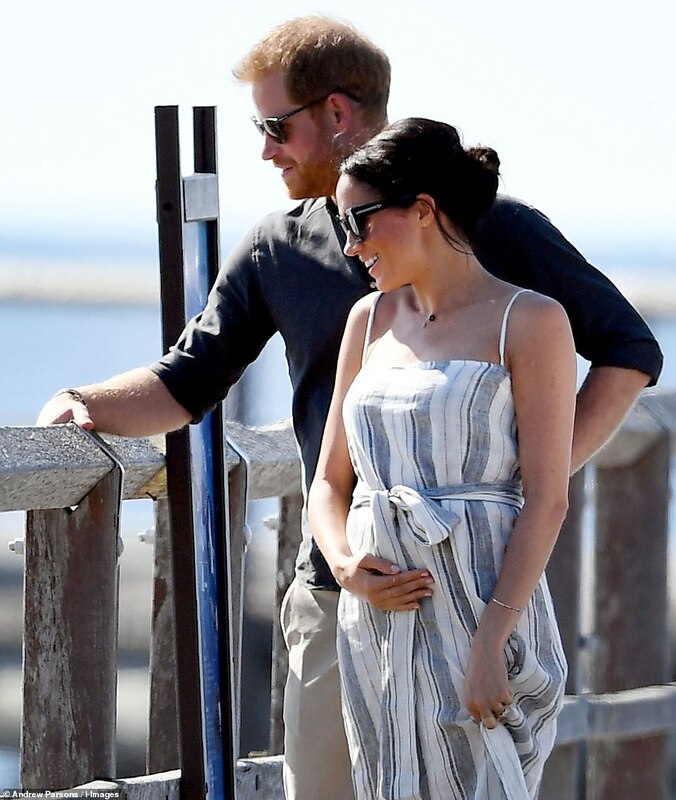 And it looked as if the morning’s rest had done her the world of good as s appeared happy and relaxed holding her baby bump as she took a stroll with her husband before meeting wellwishers. A royal aide said she took a break from engagements because of a ‘tiring few days’. The aide added: ‘We were concerned about the road on the island which are incredibly bumpy and uncomfortable for anyone, let alone a pregnant woman. 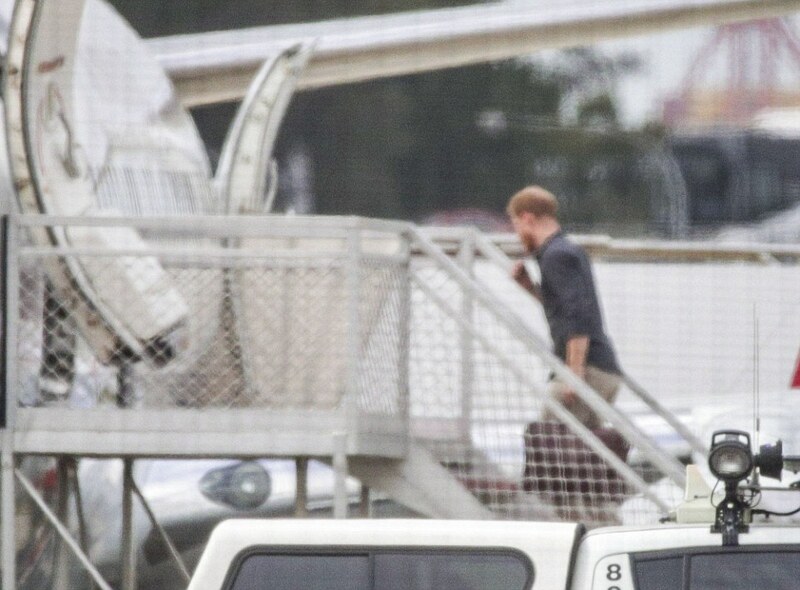 Harry arrived at Kingfisher Bay jetty by boat, having just visited the historic McKenzie’s Jetty nearby. After Meghan had greeted him at the end of the pier, the couple walked down together to meet the waiting crowds, hand in hand. 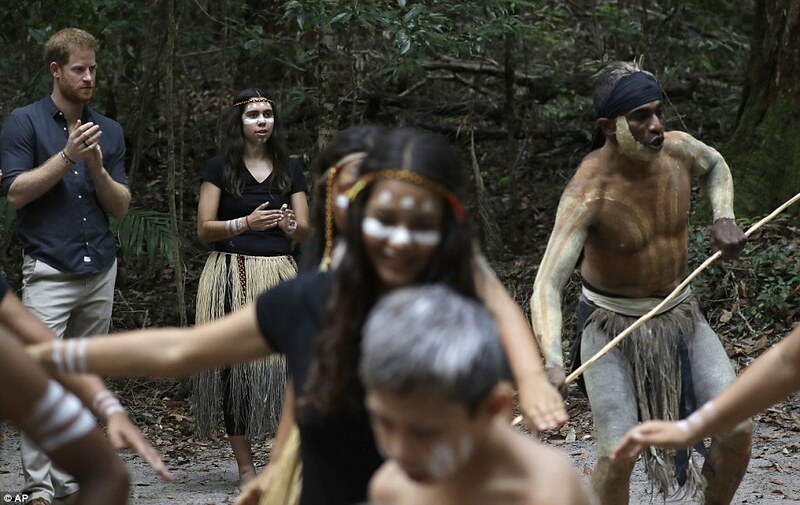 They were greeted by the premier of Queensland before stopping to watch a Butchulla People dance group on the beach, surrounding by cheering well-wishers. They told the couple how they had held a royal wedding party to celebrate their marriage back in May. ‘Oh my goodness, how sweet of you!’ exclaimed Meghan. The duke was also taken by a sign reading ‘Rangas rule’, an Australian slang reference to his ginger hair. Julianne, Ebony and and Lily Reid gave her a home-made baby changing mat. The expectant couple appeared utterly delighted by it. ‘Does it have koalas on?’ Asked Harry. Indeed it did, as well as every other notable native Australian animal. ‘They have got to the be the most beautiful couple I have ever met,’ said Lily. Meghan also bent down to speak to Noeline Walk, 85, Fraser Island’s oldest and longest-living resident at 45 years and counting. ‘She asked me since I was local what I would suggest she have for tea,’ Mrs Walk recalled. Mrs Walk also recalled how she had got to meet the Queen on her first visit to Australia in 1953/54. Aunty Joyce, 87, told Meghan that although her name was Joyce Owen, everyone called her Aunty. 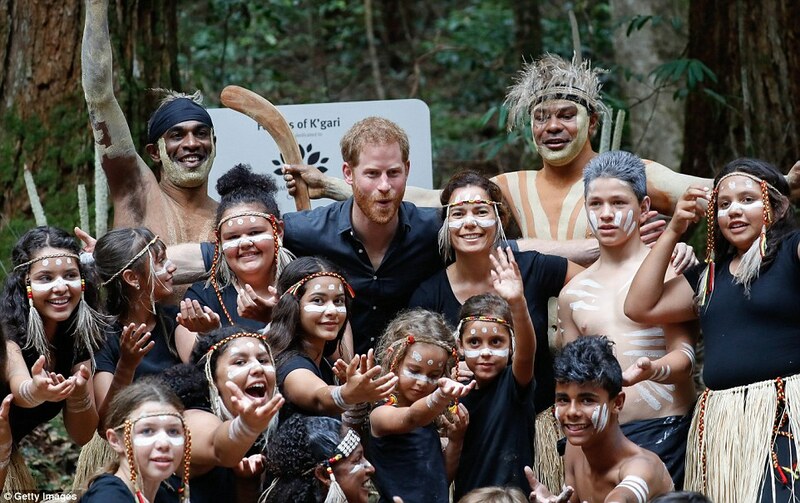 Earlier the Duke of Sussex took a separate boat to the island and took part in a traditional Welcome to Country smoking ceremony to ward off evil spirits by members of the Butchulla People, the traditional owners of the island, which they call K’gari, meaning paradise. Aaron Henderson and Darren Blake wafted smoke from a bucket of burning Paper Bark and Blue Gum leaves towards him, while songman Fred Bulanyu Leone called out to their ancestors and tapped out a rhythm with a pair of bar gan – ‘killer boomerangs’ – traditionally used for hunting. 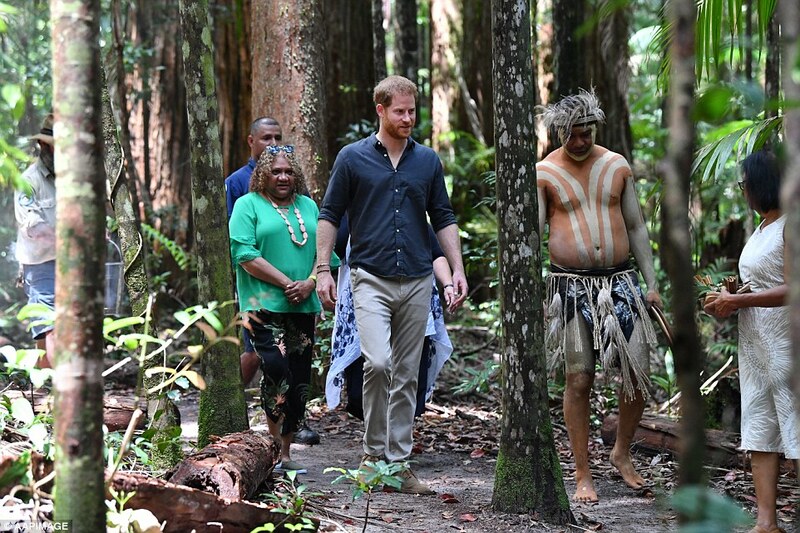 Prince Harry took off his shoes and had his feet brushed with leaves during the indigenous ceremony and later walked in the shallows of Lake McKenzie, splashing his face with the cool, clear water. 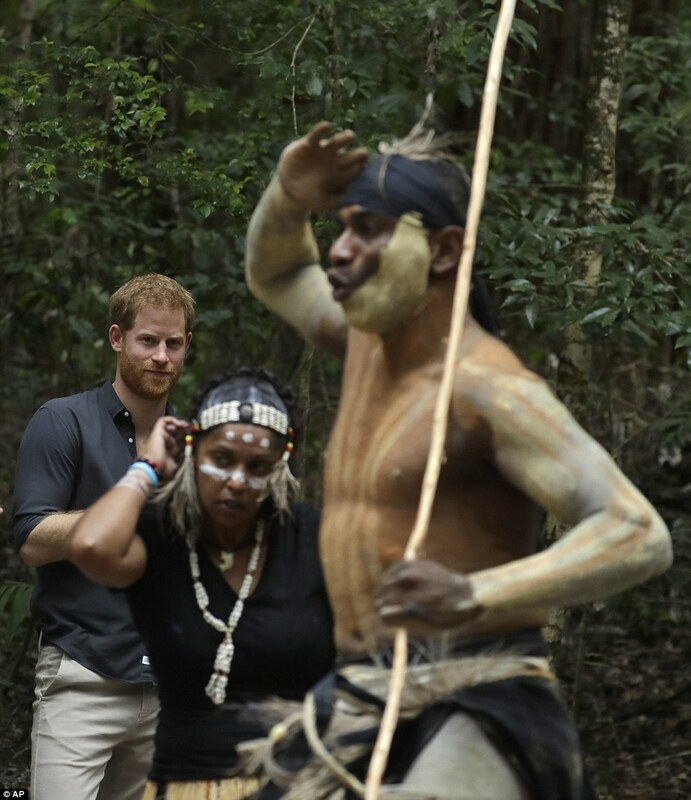 He also watched indigenous dancers and gave an address as he unveiled a plaque for the dedication of the Forests of K’gari to the Queen’s Commonwealth Canopy, which raises awareness of indigenous forests. ‘This is actually the second time this plaque has been unveiled – which I know is highly unusual. 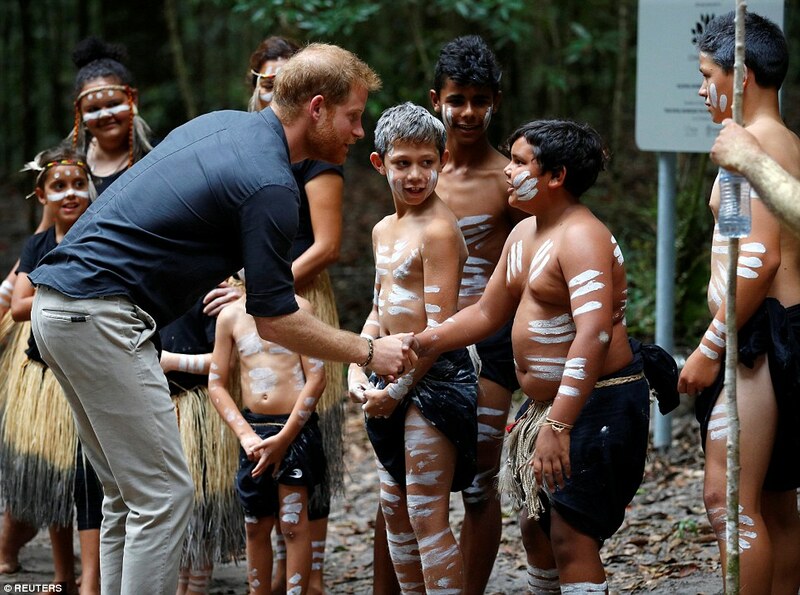 The first time was by my father – The Prince of Wales – in Bundaberg earlier this year when he was visiting. I now have the privilege of unveiling it in situ,’ Prince Harry said in his speech. ‘I know that my father came to K’gari in 1994 for a ”day off” during a Royal Tour so he has an appreciation of the importance of this place. Luckily we are both highly skilled when it comes to unveiling plaques. 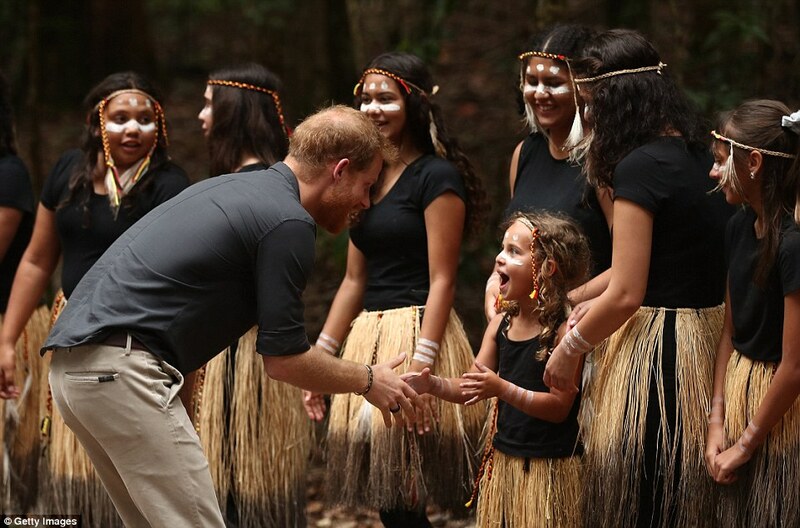 ‘The Queen’s Commonwealth Canopy is an opportunity for the Commonwealth to unite to protect one of the world’s most important natural habitats – forests. ‘Forty-two out of the 53 countries are now taking part and I hope that others will join soon. The programme is committed to raising awareness of the value of indigenous forests and to saving them for future generations. Put simply, without trees and forests, we don’t survive. It is a symbiotic relationship, and one that so many people still fail to realise. 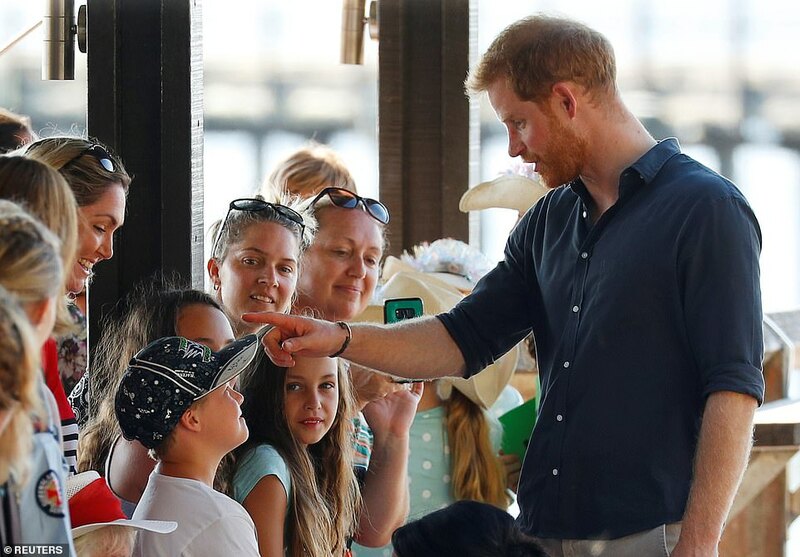 The Duke of Sussex was left blushing after a pensioner told him he was ‘much better looking in person’ at the plaque unveiling. 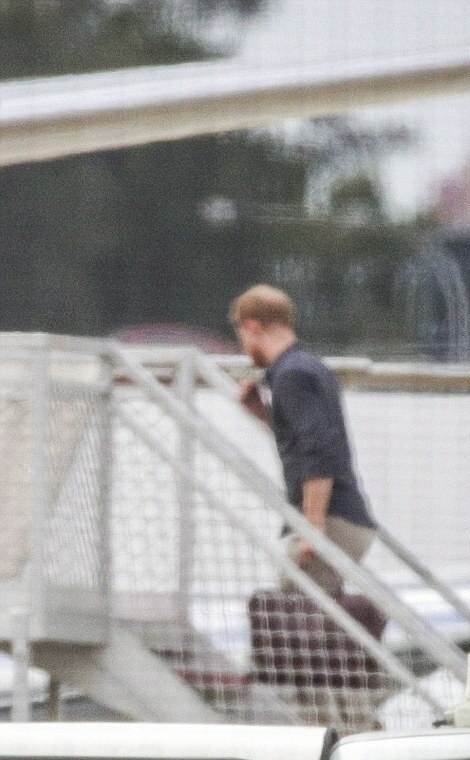 Prince Harry, 34, was without his wife, the Duchess of Sussex, who was resting because of her pregnancy. 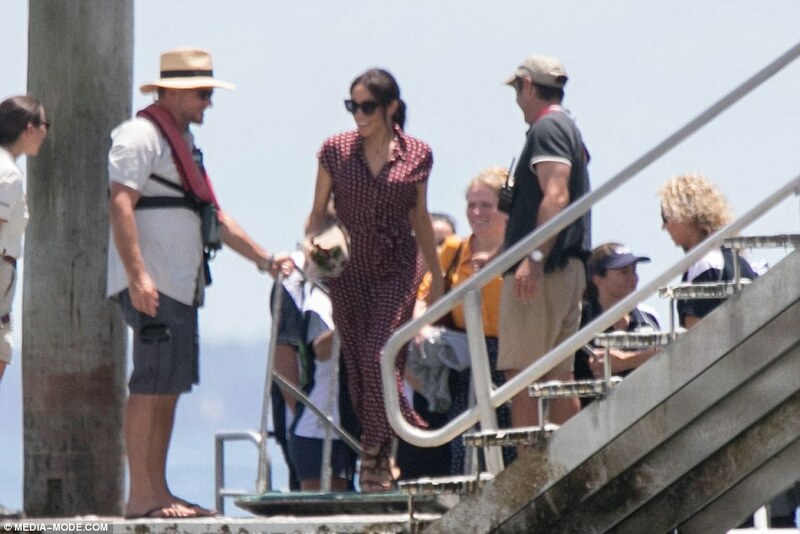 The pair travelled to Queensland together from Sydney for the next leg of their marathon Commonwealth tour on a military flight on Monday morning, before the royal couple went their separate ways – the Duke took the barge to the island, which was reportedly refurbished ahead of the occasion, while the Duchess, dressed in a maroon, polka-dot dress by And Other Stories, arrived on a whale watching vessel. She then remained at their hotel while he travelled into the rainforest. Aides insist Meghan is not sick but simply tired. And the bumpy terrain of the World Heritage island, the largest sand island in the world, simply isn’t suitable for an expectant woman. 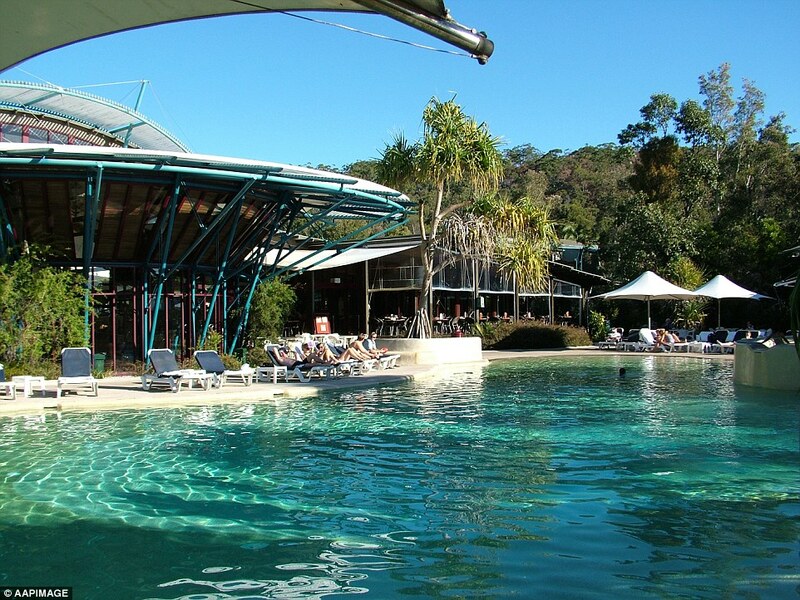 The Fraser Island rainforest is home to the Island’s satinay trees which, known for their hardiness in water, were used to build the London docks in the 1930s. The island has a total of 206,970 acres of protected forest and some trees are more than 1, 000 years old. The Duke gazed up in awe at the 1,000 year old Satinay trees as he was led into the forest to a clearing around a sacred Spirit Tree. Butchulla Land and Sea Ranger Conway Burns explained: ‘When we die, we go through an initiation. ‘Our spirit goes through our body and through our sacred lakes and up to the sky. It returns to our people in these trees,’ Burns explained. 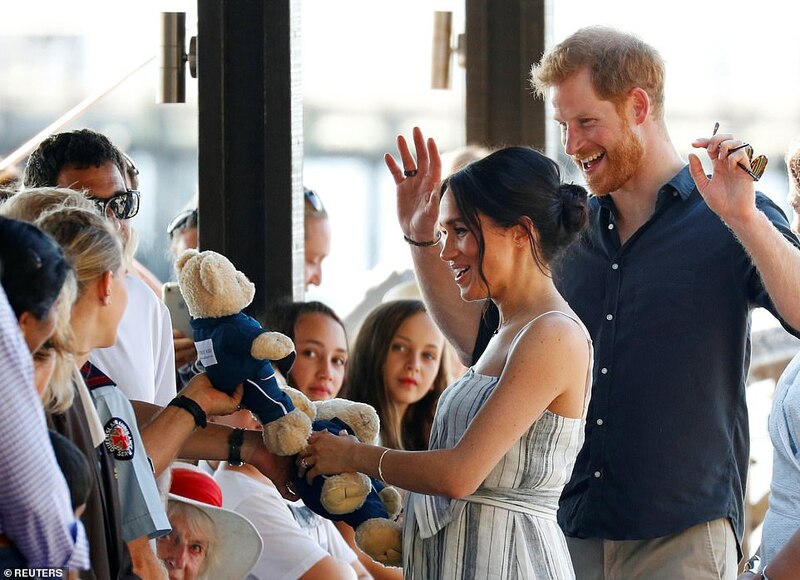 Crowds had lined up along the Kingfisher Jetty to catch a glimpse of the couple as they stepped off their boats, with both the Duke and Duchess giving a wave to excited onlookers when they arrived on Fraser Island. The Duke was expected to take particular interest in his visit to the beach, as it served as a training base for an elite Z Special Force Unit during World War II. 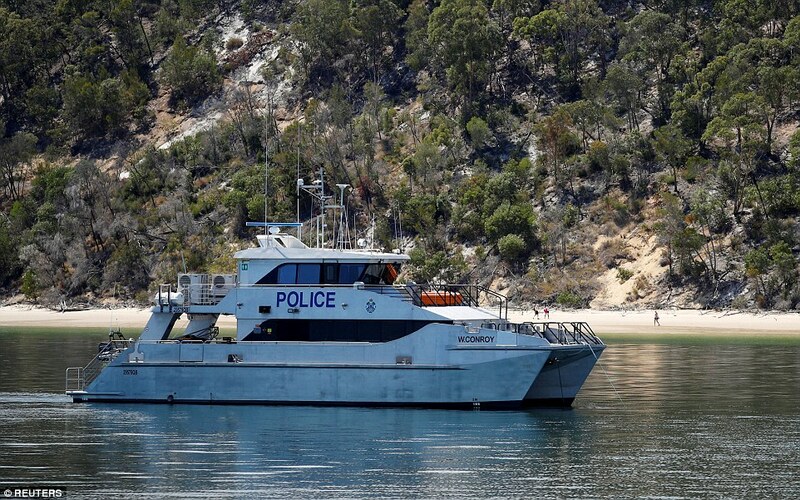 The unit used the area to prepare for jungle and amphibious training ahead of missions into Asia and are credited with playing a major role in Australia’s victory at Singapore Harbour. The ruins of the Z Force Commando School remain on the western side of the island, nearby the resort. 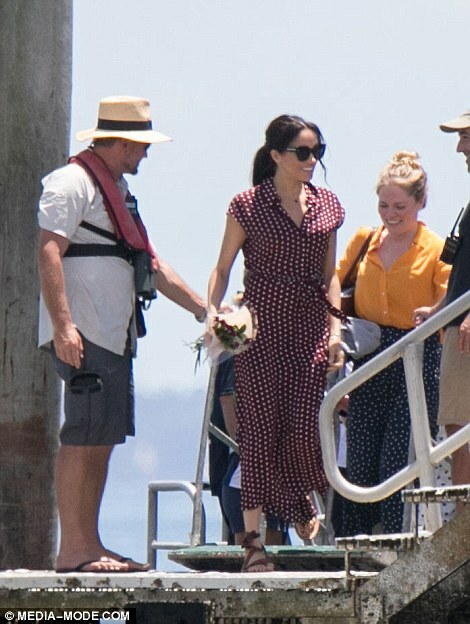 Later, the Duke will head to Kingfisher Bay and walk along the jetty, hopefully with Meghan. The couple are expected to be greeted by an enthusiastic crowd of fans, as tickets to cross to Kingfisher Bay have sold out for the day. 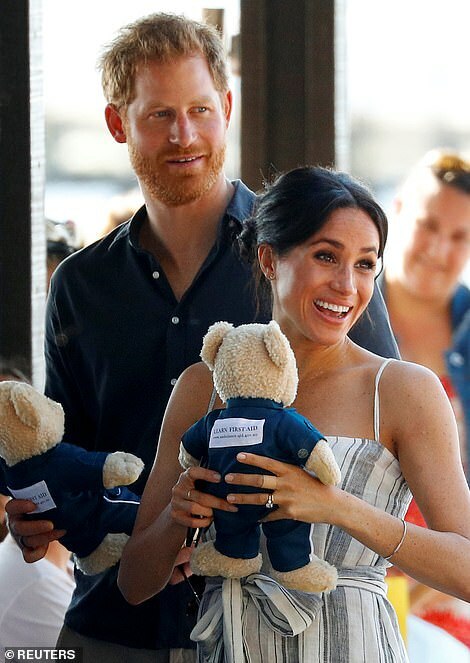 When Meghan arrived on the island, Hervey Bay Eco Marine Tours posted a photo of the Duchess on their Instagram page with the caption: ‘VERY exciting day here today at the Marina. 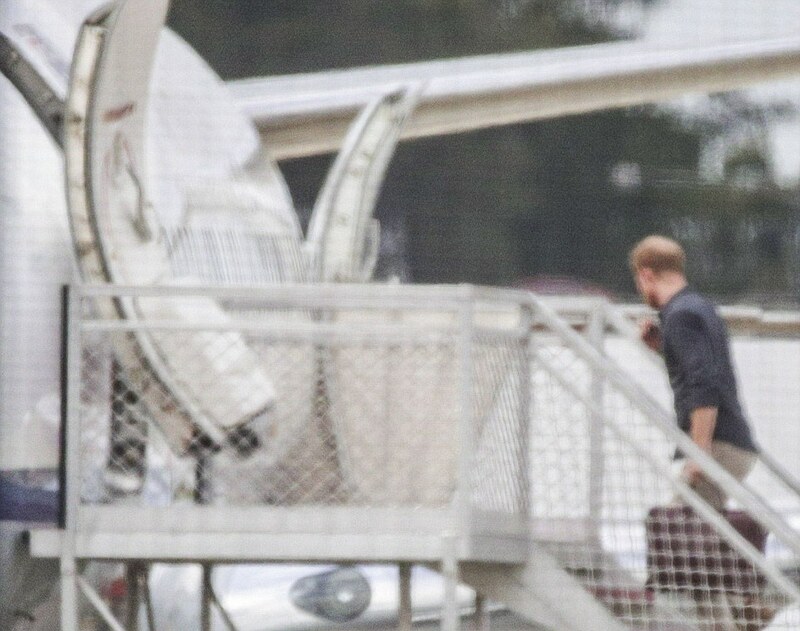 The glowing Meghan Markle passing through on her way to K’gari’. 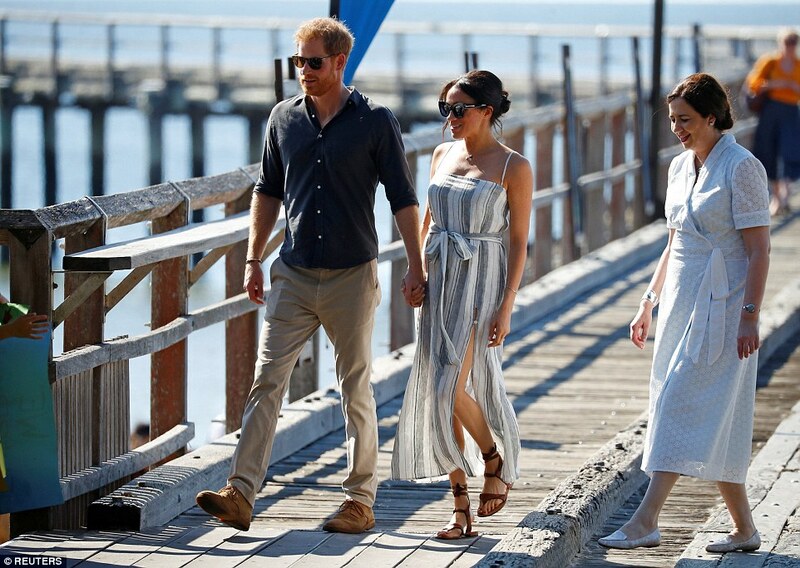 Fraser Island is the fourth stop on the royal couple’s Australian leg of their tour, after they visited Sydney, Dubbo, in the New South Wales central west, and Melbourne. 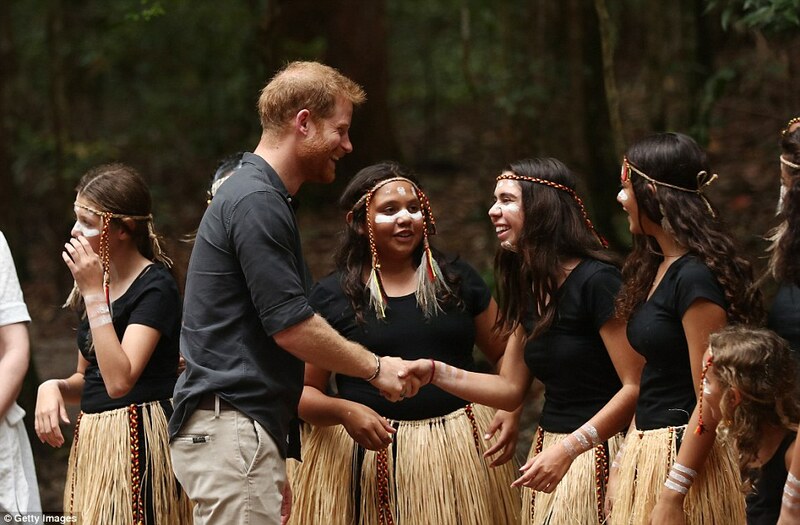 Following their visit to Fraser Island, the royal couple are heading to Fiji, then Tonga before a trip back to Sydney for the closing ceremony of the Invictus Games. Their mammoth 16-day tour finishes in New Zealand.